In order to export your data directly to Sage One, you will need to link your Datamolino Folders to it. You will be prompted to connect to Sage One whenever you create a new Datamolino Folder. 2. Choose connect to Sage One and follow the instructions. A pop-up window will appear asking you to choose which accounting software do you want to connect to. Choose "Connect to Sage One". Having done this, you'll be automatically redirected to the Sage One homepage, where you'll need to provide your credentials. After the login, you'll need to authorise the Datamolino application. Please note: If you experience problems, try to login to your Sage One account before attempting the connection. This has proven to be the most reliable method. International Sage One users: Currently only the UK and Ireland version of Sage One is supported. 1. Click "Export to Sage One" within your Folder. Select documents that you wish to export and click "Export to Sage One". An Export Wizard will pop up that will guide you through the export process. If you press the button when no document is selected, all documents that are in the "ready" state will be queued to export. Please note: Datamolino remembers the pairing of Suppliers to your Supplier contacts. It also learns the GL codes that you use for specific tax rates of a Supplier. It is best to do the first couple of exports with smaller batches to teach Datamolino these pairings. You can assign the invoice to an existing Supplier contact or you can create a new Supplier contact directly in the Export Wizard. Choose the GL code that you wish to assign to the transaction. Scroll down to find the " Export" button and click on it, when ready. 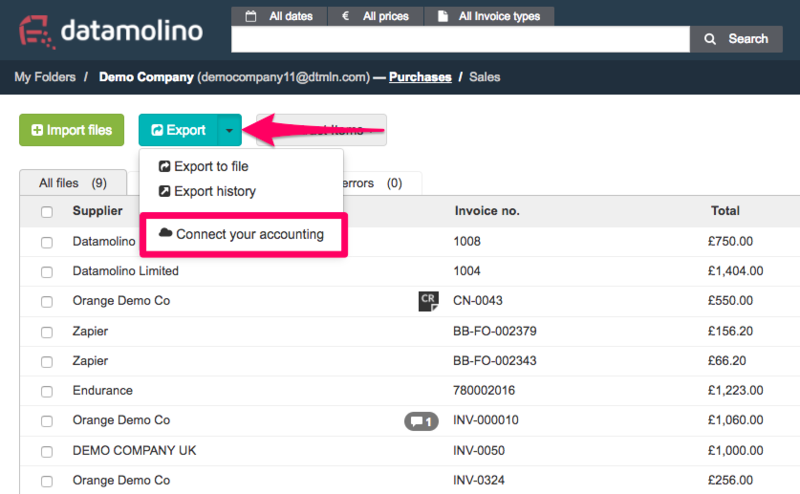 Once the export is completed, you will see your invoices directly in your Sage One - "Purchase invoices"!